The infection and control measures applicable to dentistry in the United Kingdom, taking into account current knowledge about infection transmission. The need to establish clear policies and procedures to ensure that all employees adhere to the required standards for infection control and prevention. As well as complying with the HTM 01-05 guidelines, each dental practice must establish its own infection control policy. This policy must address the particular requirements of the practice. It also needs to be a written policy, readily available to all employees and regularly updated. Hand hygiene and skin care. Gloves must conform to European Community standards (EN 455, parts 1,2,3) and US standards (ASTM 1671-97). As the name implies, single use gloves can only be used as such, and must be correctly disposed of after use. Use non-sterile gloves for cases in which contact with bodily fluids (even fluid on equipment) will occur. Use sterile gloves for surgical procedures or when there will be contact with sterile areas. Use general purpose gloves for cleaning instruments before they are sterilised or when there is likely to be contact with contaminated surfaces. The use of plastic aprons is appropriate for circumstances in which clothing may come into contact with bodily fluid.4,5 Aprons are also items of protective clothing that are designed for single use only. Dentists should also wear facemasks for similar reasons to that given for eye protection. It is important that the soap covers the entire hand surface while washing and rinsing. Vigorously rub hands for a minimum of 10-15 seconds. 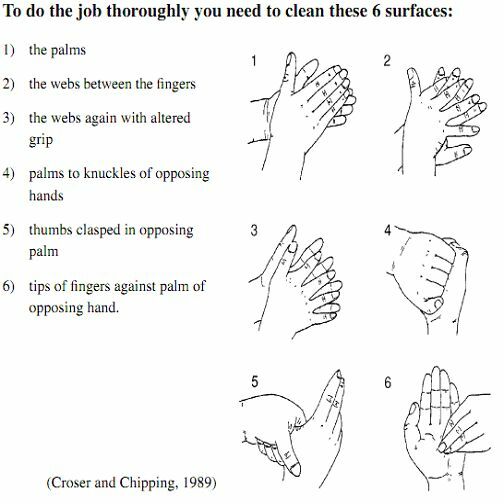 Particularly focus on cleaning finger tips, thumbs and the spaces between the fingers.4 Hands should be thoroughly rinsed, with all traces of soap removed. The 'Anatomic Scrub Technique'8 is an effective method of ensuring that hands are adequately cleaned. This technique is shown in the diagram below. If possible, avoid the use of sharp instruments. When sharp instruments are required to be used, they should be used and disposed of safely and carefully. This will reduce the risk of 'needle stick injury' and exposure to blood-borne viruses.4 It is also essential that staff are correctly trained in the use of sharp instruments, and that certain procedures, such as injections, are only carried out by suitably qualified staff. Disinfection: Reducing the number of micro-organisms to a level that is not harmful.10 All 'medium-risk' items that have come into contact with mucous membranes or which may be contaminated should be disinfected. This can be achieved by the application of heat or chemical disinfectants. Sterilisation: Sterilisation achieves the removal or destruction of all micro-organisms, and is achieved by applying pressurised steam or dry heat.10 All items that fall into the high risk category of having penetrated skin or mucous membranes, or which have entered sterile body areas, must be sterilised. Keep the practice clean and free from dirt and dust. Only staff adequately trained in the necessary procedures should carry out the decontamination. Items should be physically cleaned before decontamination. A colour coding system is designed to prevent cross contamination. 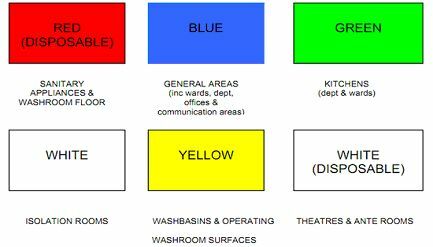 It helps to identify areas that are at high risk of cross contamination, and covers the use of cleaning equipment and gloves.4 A colour coding system based on the National Colour Coding System for the British Institute of Cleaning Science is often recommended, and is indicated in Diagram 2 below. Infection prevention and control forms an important part of practice for all health care professions including dentistry. In dental practice, both patients and health care workers may be exposed to a number of blood borne and upper respiratory pathogens. Professional dental associations, including provincial licensing authorities in the United Kingdom, have advocated that universal precautions be applied to all patients, as their potential infectivity may not be known. Dental offices and the staff should also utilise the full range of recommended infection control procedures that are necessary to minimise the risk of cross-infection in dental practice.